Black hickory is a small to medium tree with short, crooked branches and a narrow crown. Leaves are alternate, feather-compound, 8–12 inches long. Leaflets usually 7, lance- to pear-shaped, 4–6 inches long, toothed; lower surface yellow-green with rusty hairs; leaf stalks with rusty hairs and tiny scales. Bark is dark gray to black, tight, not scaly, with irregular blocky ridges and deep furrows. Twigs are slender, often crooked, tapering abruptly to the terminal bud. Young twigs and terminal buds have fuzzy, rusty scales with tiny yellow dots. Flowers April–May. Male and female flowers separate on the same tree. Male catkins in threes, 2–3 inches long; female flowers 1–2 with reddish hairs. Fruits September–October, single or in small clusters. Nuts globe- or pear-shaped, 1¼–2 inches long, rather flattened; husk thin, brown, covered with yellow scales; kernel small, round, sweet, edible. Similar species: Distinguished from pignut hickory by 7 (not 5) leaflets, tapering twigs, and the yellow bud dots. All hickory flowers are quite similar. They emerge in spring with the leaves. Both male and female flowers appear on the same tree. Black hickory is usually found in acid soils derived from chert, sandstone, or igneous rock in rocky or dry upland woods. It often grows where fertility is low and is usually considered an indicator of poor soil. 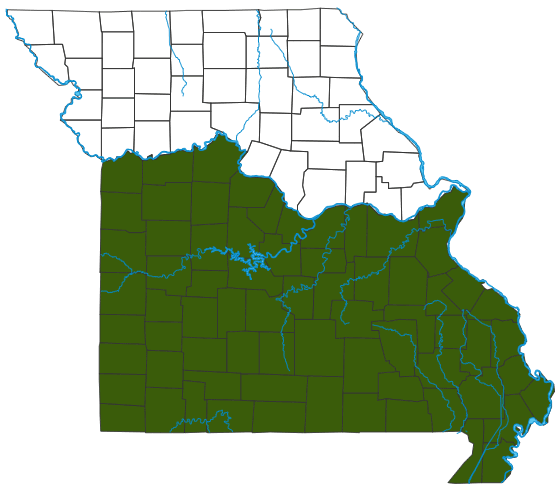 Widespread south of the Missouri River. The strong, hard wood is brittle and commonly used for fuel. The thick shell of the nut makes the kernel hard to extract, but hogs sometimes crack them, hence the other common name, Ozark pignut hickory. Squirrels and mice eat the nuts, and squirrels also eat the buds. Hickory leaves are required food for many of our most beautiful and remarkable moths. The larva of the giant regal moth is called the hickory horned devil — not a very dignified name for the largest caterpillar on the continent!